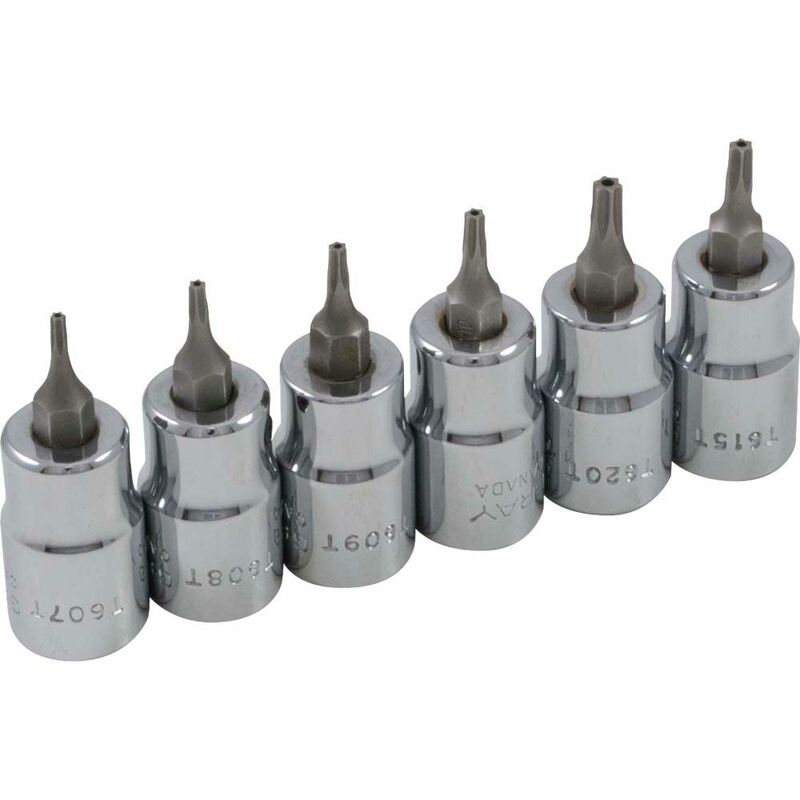 The sockets in this 6 piece 3/8" drive tamper resistant Torx<sup></sup> head socket features a precision tip ensuring a tight and secure fit with the fastener. The exact fit reduces likelihood of fastener stripping or rounding. The chromed socket has outstanding corrosion resistance as a result of our proprietary in-house plating process. Made in Canada and backed by Gray Tools worry-free lifetime warranty. Contains Sizes: T7, T8, T9, T10, T15, T20. DirectTorque Technology, Polished chrome vanadium finish, Knurled control rings, Hard stamped markings, Lightweight aluminum rail with easy slide buttons, Full Lifetime Warranty. DirectTorque Technology, Polished chrome vanadium finish, Knurled control rings, Hard stamped markings, IP65 rated storage case, Full Lifetime Warranty. Socket Set Torx Head 6 Pieces 3/8 Inch Drive Tamper Resistant The sockets in this 6 piece 3/8" drive tamper resistant Torx<sup></sup> head socket features a precision tip ensuring a tight and secure fit with the fastener. The exact fit reduces likelihood of fastener stripping or rounding. The chromed socket has outstanding corrosion resistance as a result of our proprietary in-house plating process. Made in Canada and backed by Gray Tools worry-free lifetime warranty.